MAG, the magnetometer instrument, is designed to make measurements of magnetic field strength and direction. This information is used to identify boundaries between the various plasma regions, study the interaction of the solar wind with the atmosphere of Venus and provide support data for measurements made by other instruments. The magnetometer instrument consists of two tri-axial fluxgate magnetometers, one mounted on the outer surface of the spacecraft and one on the end of a 1 metre long deployable boom, and an electronic control unit. The use of two sensors reduces the effect of the intrinsic magnetic field of the spacecraft on the measurements. The fluxgate sensors each consist of two single ring-core sensors measuring the magnetic field in the X- and Y-directions. The magnetic field in the Z-direction is measured using a coil surrounding both the X- and Y- sensors. The side length of the cuboid sensor triad is approximately 50 mm. The sensor electronics generates an alternating current with a frequency of ~9.6 kHz which is applied to the excitation coils in the sensors and drives the soft magnetic core material deep into positive and negative saturation. The external magnetic field distorts the symmetry of the magnetic flux and generates even harmonics of the drive frequency in the sense coils with an amplitude proportional to the field strength. The induced voltage in the sense coil is digitised immediately after preamplification at four times the excitation frequency. A feedback field is used to increase the overall linearity and stability of the magnetometer. It is supplied to all sensor elements by a separate pair of Helmholtz coils per sensor axis. The current in each feedback coil pair is controlled by a 12-bit digital to analogue converter. Sense and feedback signals are continuously transmitted to the digital processing unit, which calculates the magnetic field values with a resolution of 24 bits by scaling and summing the received data. The appropriate dynamic range is defined by selecting 16 of the calculated 24 bits for transmission. The measurement range can be modified by telecommand to have a value between ± 32.8 nT and ± 8388.6 nT, with a corresponding digital resolution between 1 pT and 128 pT. The default range will be ± 262.1 nT with a resolution of 8 pT. A magnetic field of ± 10 000 nT can be independently applied to each sensor axis via additional 12-bit digital to analogue converters for compensation of any static stray field. The Data Processing Unit (DPU) controls the two sensors and the spacecraft interface of the experiment and performs internal data handling, including sampling, pre-processing, compression, and frame generation. 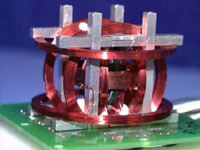 The core of the DPU is a radiation-hardened microcontroller, which was specially developed for space systems embedded control. The controlling logic for the DPU, the sensor interfaces, the address decoder, the clock generator, the reset logic and the instrument spacecraft interface (a standard ESA OBDH interface) are implemented in a Field Programmable Gate Array. In calibration mode one, feedback and sense values, which are produced in the sensor electronics and normally summed in the DPU, are transmitted separately. This mode is used for on-ground calibration and is not necessary in nominal flight operations. In calibration modes two to four, the feedback and calibration DACs of the sensor electronics are supplied with pre-programmed values. This is done statically in mode two and dynamically in modes three and four. Operating MAG in one of these calibration modes can perform a complete instrument check. In calibration mode five (Burst Mode), data is transmitted at the instrument's highest internal raw data rate, where both sensors operate at 128 Hz. This mode is used for screening of stray fields varying at rates up to 60 Hz and to study lightning in the atmosphere of Venus. The MAG instrument takes measurements over the entire orbit. MAG is operating primarily in an autonomous mode, requiring little or no commanding. Commands are required to initiate in-flight calibration sequences, to optimise variables for in-flight pre-processing (for example, coefficients for digital filtering), to command the number of operating sensors (MAGIS and MAGOS, MAGIS alone or MAGOS alone) and to switch in and out of pericentre mode. Most commands are scheduled, with real time commanding required only in response to unexpected events. After switch-on, the MAG instrument automatically began operating in standard mode - both sensors with 1 Hz data rate. During a standard 24-hour science orbit, MAG is switched to pericentre mode one hour before pericentre and switched to solar wind mode one hour after the pericentre. The instrument is commanded into the high-resolution calibration mode five (Burst Mode) one minute before pericentre for a period of two minutes. The MAG boom was deployed only 9 days after launch on 18 November 2005 to enable evaluation of stray fields in the 'science position' of the outer sensor during the cruise phase. Statistical methods, using time series of solar wind measurements, are used to determine the offset field at the magnetic field sensors, including instrument inherent offset and spacecraft static field. As a large part of the orbit around Venus is in the solar wind, these data can be used for statistical offset determination. If excessive static offset is detected, supplying suitable values to the 12-bit compensation DACs enables it to be compensated. The maximum possible compensation field is ± 10 000 nT along each of the sensor axes. A front to end health check is possible by generating artificial fields using the 12-bit compensation DACs and Helmholtz coils.